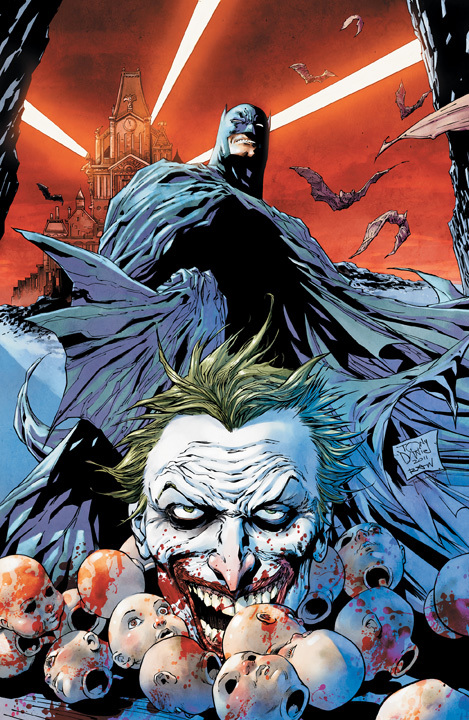 The final books have been announced for the September relaunch of the DC superhero books. We’ve collected the data, and placed it in a nice table for you to check out. 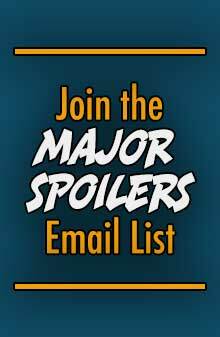 Remember, the tables at Major Spoilers can be sorted, so if you want to sort based on Genre, creator, title, or if you want to search the table, you can do it, after the jump! So what do you like? What do you dislike? How many of the books are you picking up and which have now moved off your subscription list? Previous ArticleDC RELAUNCH: History happens… NOW! 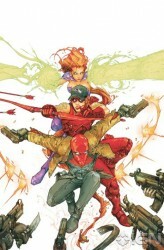 Out of them all I am really looking forward to Red Hood, and Action Comics. I would like to make a prediction about the Legion. Some of them will die. Of those thought dead, some will be transported and found by the Lost Legion. Thereby bringing them to the Main Universe. Watch to see if some of the dead match those in the Lost Legion. 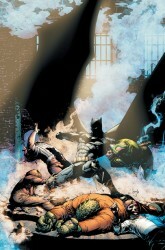 I know there are a few characters still unaccounted for: Stephanie Brown and Huntress for instance. 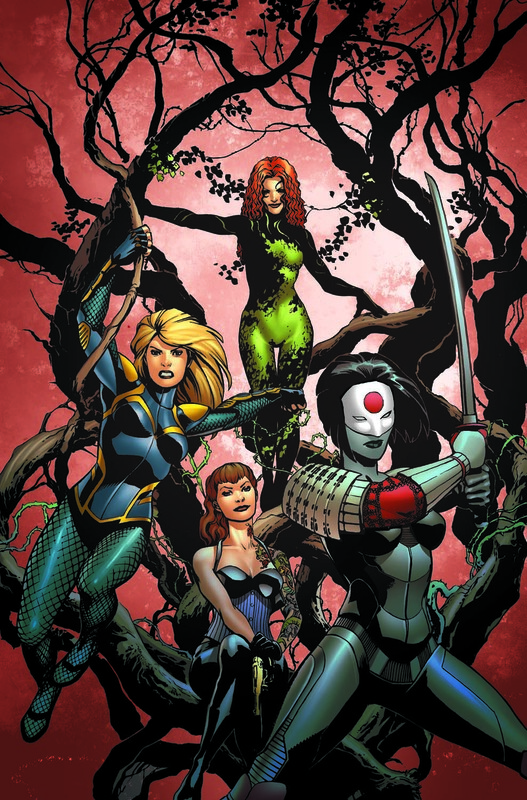 But I’m not sure how many folks read that Dan Jurgens has said the woman on the JLI cover is NOT Donna Troy. Has she shown up anywhere else? 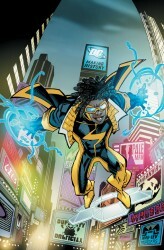 There’s a new character that appeared in Booster Gold’s latest issue, Alexandra Gianopoulos (no codename yet). My money’s on her. For me Legion of Super-Heroes and Legion Lost for sure. Action Comics and All-Star Western probably. And others I will just have to see. 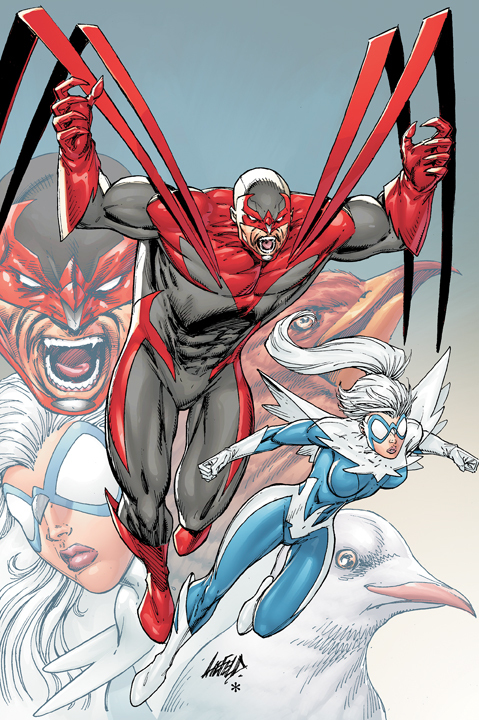 Oh, and Hawk and Dove. Nope, not gonna happen. I’ll be at least giving a good tryout to Action, Superman, LoSH, Legion Lost, Aquaman, Nightwing, and Demon Knights. 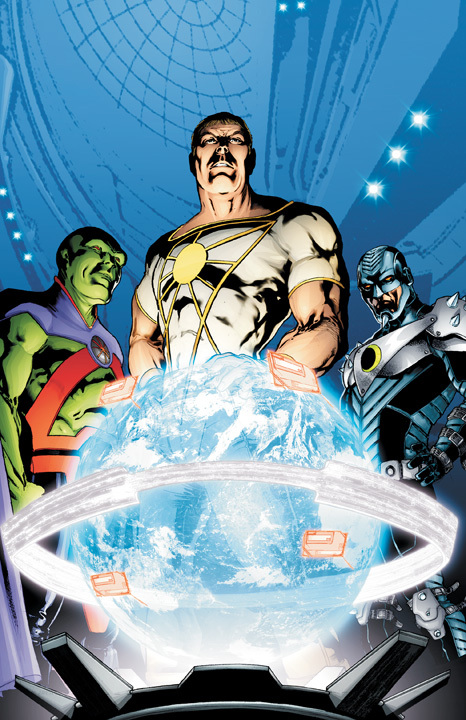 I’m curious what their plans are for the former Earth 2 heroes that seem to be mostly MIA. I noticed the Grant Morrison Action announcement referred to Superman as the “first super hero”. The annoucement almost makes it sound like Action is set early in his career, while Perez’s Superman is set is present day DCU. As if Action, or at least this arc, is kind of a Superman Year One setting up the new Superman continuity. 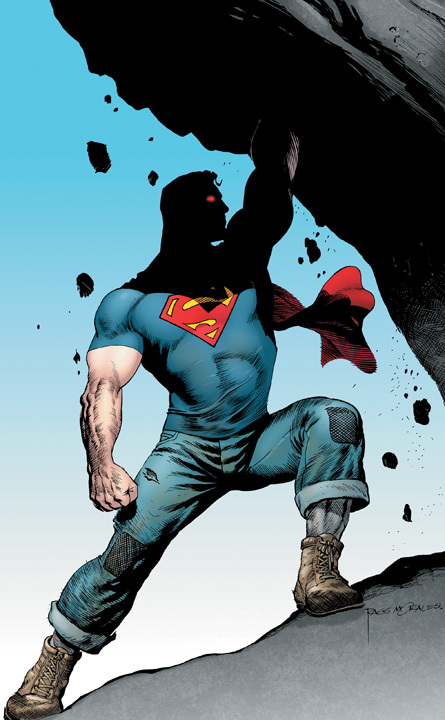 I cannot believe that an old traditionalist like me is stoked over the George Perez drawing of Superman in updated togs…but I am. Sergeant Rock??? The Blackhawks??? Oh…my…stars…and…garters! 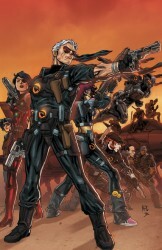 The Wildstorm characters I don’t know much about but I’m interested in seeing how they “merge”. 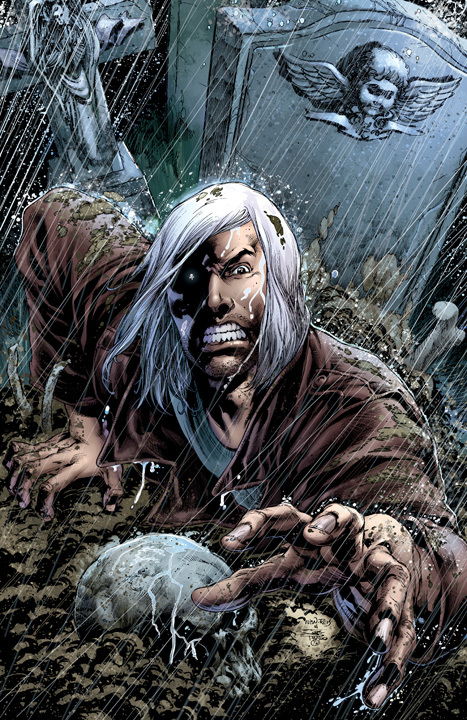 I’m also interested in seeing if the two characters with Jonn Jonzz on the Stormwatch cover are written as they were in Wildstorm. 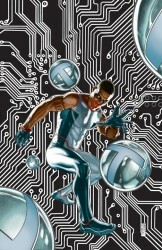 I don’t like the fact that they’re apparently showing Superboy as a cyborg or android, rather than a clone. And it appears that the “new” Supergirl is a combination of Supergirl and Power Girl. So… What’s missing? What is BLATANTLY missing from these “52” titles? The Justice Society of America. 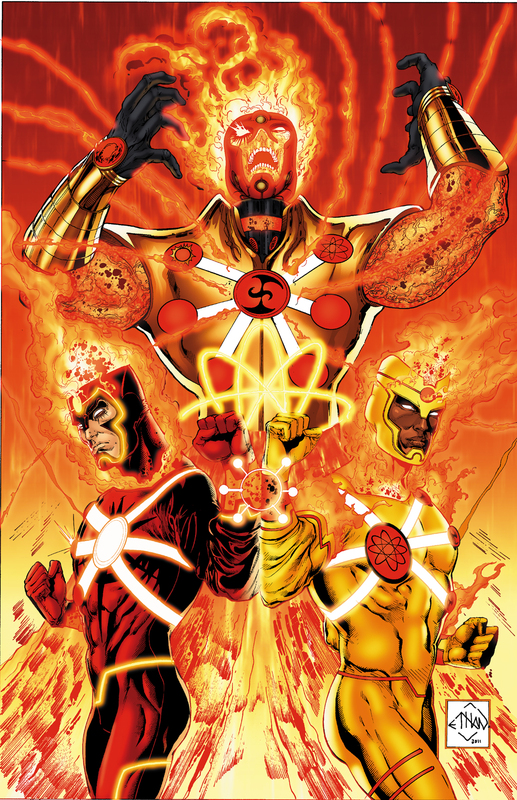 Jay Garrick, Alan Scott and Ted Grant…that’s what. Three Justice League titles an nada, zip, nunca of the JSA except Mr. Terrific? You are looking at a JSA mark that is truly crushed. Here’s hoping someone makes a run over to the “new” Earth 2 sometimes. Some of my favorite “B-list” folks missing: The Specter, The Phantom Stranger, Blue Devil, Azrael, Ragman, Red Tornado, Steel, the Doom Patrol, Metamorpho, Black Lightningl. But no Alan Scott in that great original Green Lantern costume? Feh! 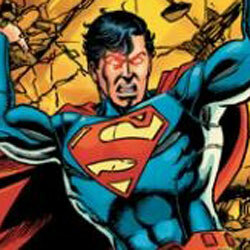 The Cyborg-Superboy is probably to avoid the Superboy lawsuit. He’s not a cyborg. The cover is metaphorical. 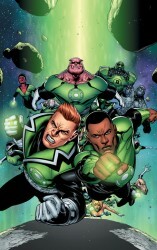 But no Alan Scott in that great original Green Lantern costume? Feh! I ranted about that in my last review of the JSA mag. 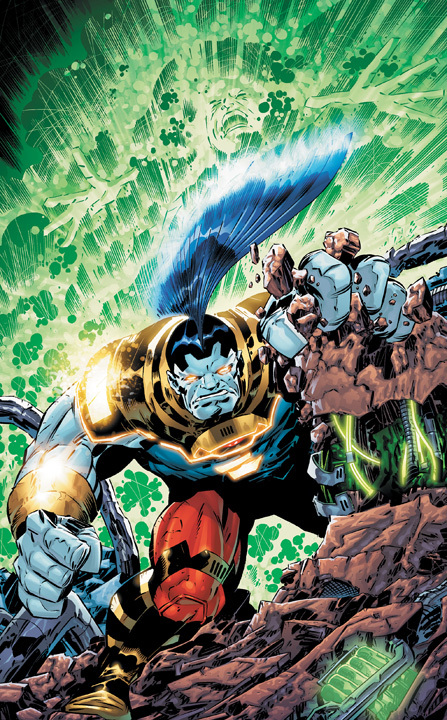 But at least for awhile I still have him working with the current JLA in the Eclipso arc in his classic uniform and not the “Green-Light Special” that makes him look like a traffic signal. 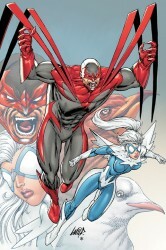 Please tell me that Hawk and Dove cover is just a guest cover. Please? Teen Titans #27 – #28 had Rod Liefield as guest artist and the sells was so bad, it nearly got the title canceled. Rob’s fan base…there’s what…3 or 4? Hawk and Dove are great characters, even though Rob did draw their mini-series way back when…but with high hopes of number breaking sells with his art on the book…not going to happen. Someone sure needs a slap in the back of the whoever hired him. Mark my word, Hawk and Dove will be on the bottom when the sells report comes out! I’m not really updated on the Who’s Who of DC creative staff, but I know George Perez and JH Williams III are, primarily, pencillers, right? And damn good ones. Why does the list has them as writers? Not that that is impossible. Didn’t Perez also work with Wolfman in co-writing Teen Titans/New Titans way back when? 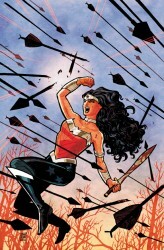 George Perez is the man behind the Wonder Woman relaunch back in ’86, as a writer, and has been credited with co-writing the Wolfman/Perez Titans as well. How many of the books are you picking up and which have now moved off your subscription list? I see none on the list I want to buy, so zero and all. i’m with you! PASS X 52! 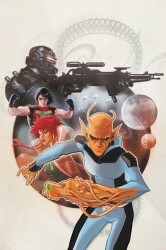 I’ll be picking up LoSH and Legion Lost for sure. Demon Knights, JLI and Animal Man seem interesting to me too. 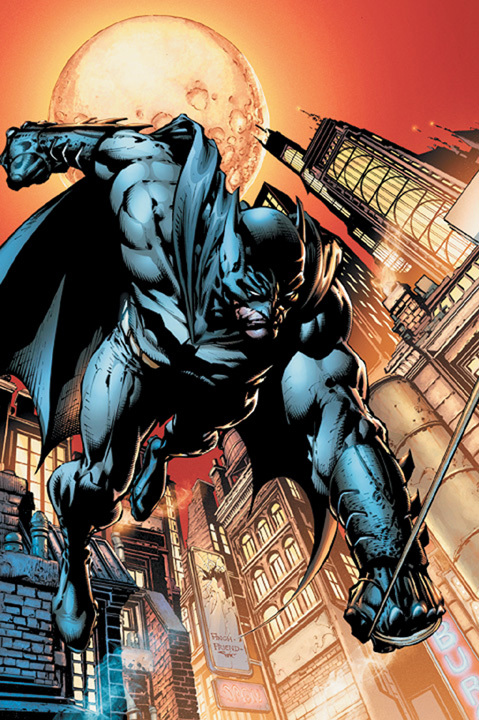 I am saying maybe to some of the Batman-specific Bat titles. 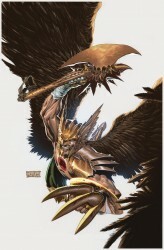 Then with much reluctance I will likely pick up Hawkman and Suicide Squad’s first issues or so, as ugly as they look. Aside from that, nothing appeals to me. No Power Girl? No Batman Beyond? I’m out. I can’t support this relaunch. I’m a little surprised Power Girl is still unaccounted for, too. After all the work they did a few years ago to fix her origin and make her a viable property, it would be sad if she’s been wiped away from the new DCnU. 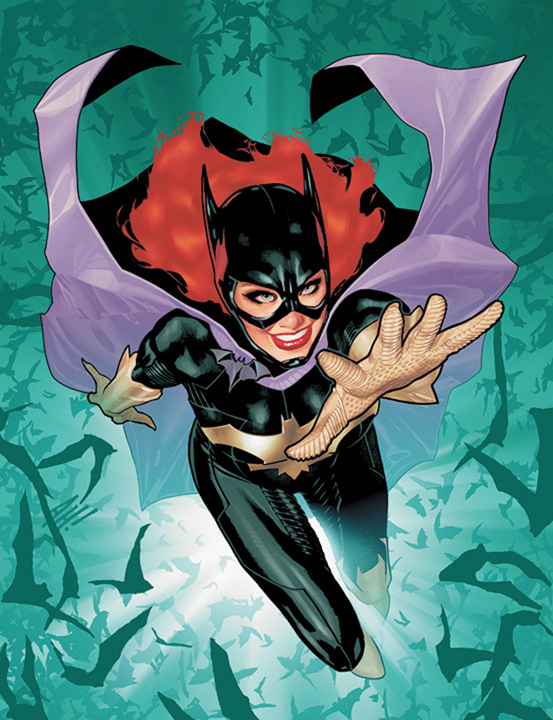 It’s missing characters like her and Huntress that make me wonder if the “old” new Earth will still be lurking out there waiting to make its presence known just in time for a big DCnU crossover event! Just saw the JLI solicit; it lists “Batman, Booster Gold, Green Lantern Guy Gardner, August General in Iron, Fire, Ice, Vixen and Rocket Red”. Still doesn’t explain who the dark-haired woman is — wouldn’t they just say Gypsy? 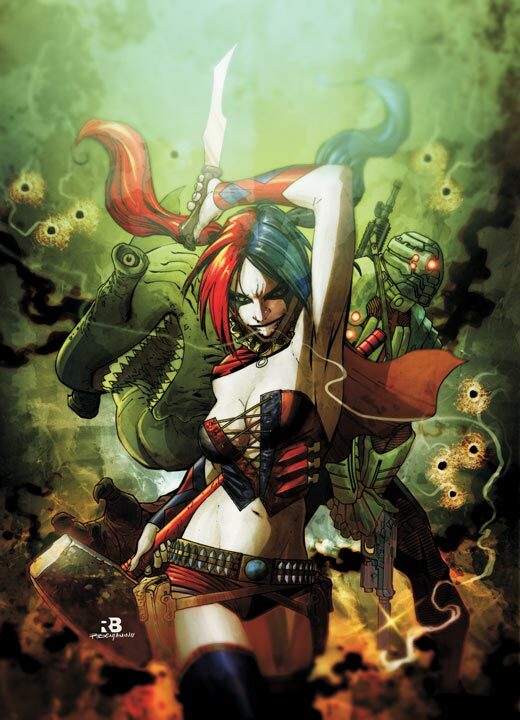 Perhaps she is the token new character no one will care about and foget existed when gone for two issues. I already miss the JSA. We know some books are just on hiatus–like Morrison’s Bat book. Has anyone heard about other titles that might be coming back later in the fall? Where’s the Marvel family? As noted elsewhere, where’s the Justice Society? 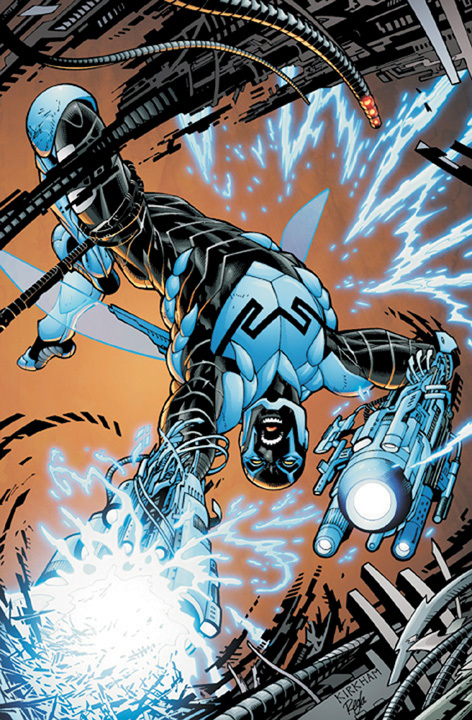 Any version of The Atom? My HYPE is strong! Amazing job making me want them all. That’s what they all say…. Whoever “they” is. No Power Girl? But “Hawk and Dove”, “Voodoo”, and “Captain Atom?” Power Girl is a book that was pretty popular before the writers shifted and it’s still pretty popular AFTER! No JSA? 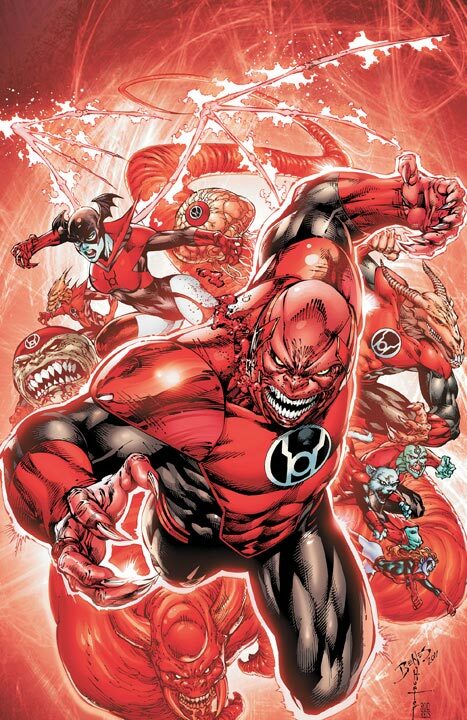 But “Red Lantern Corps?” If DC wants to be younger then let them be younger and have a few crochety old superheroes to train them! (It was working fine before they split the team into 2 books!). 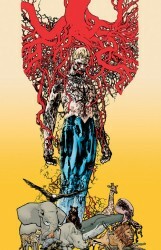 Legion Lost should last 6 issues to a year and then get them back to the future. 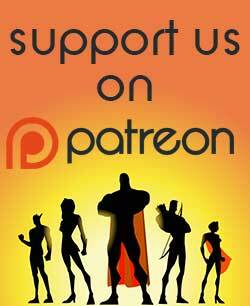 Open up a new spot for a Milestone book, the JSA, or Doom Patrol. 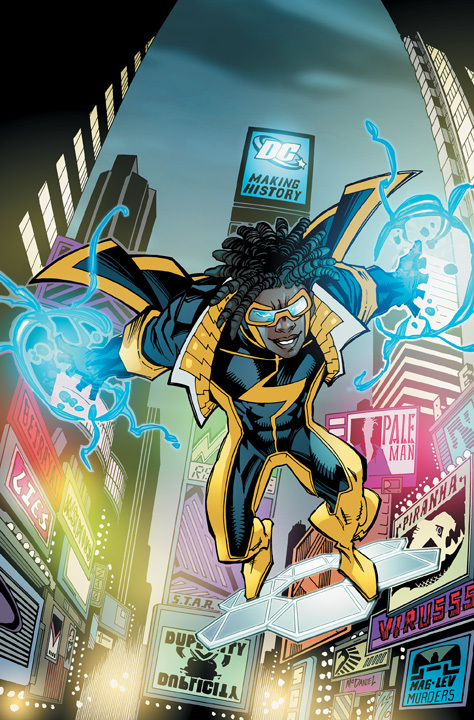 I will say this: good for DC for FINALLY giving Static his own book, getting a new Blue Beetle book out, and for trying a Mr. Terrific book. More diversity in comics! Read the post above you. 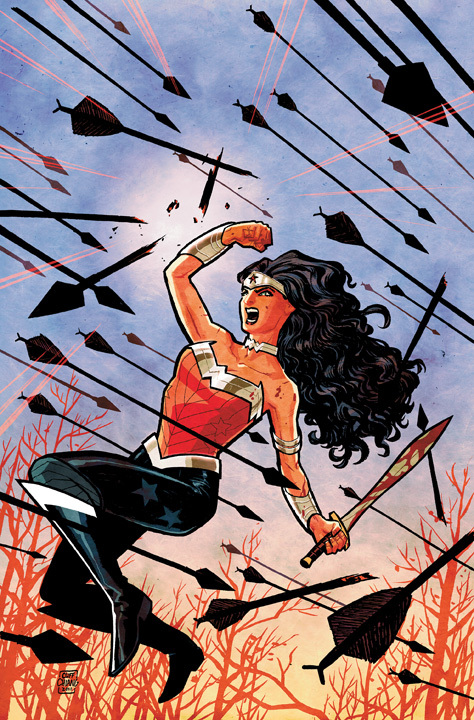 These are the books slated for SEPTEMBER, not the entirety of the superhero line. Powergirl could end up being launched in October. I would be more concerned about Huntress being missing since Birds of Prey is the place where she would be found, unless they plan on her having her own title…OMG, that could be Gail’s missing third book. 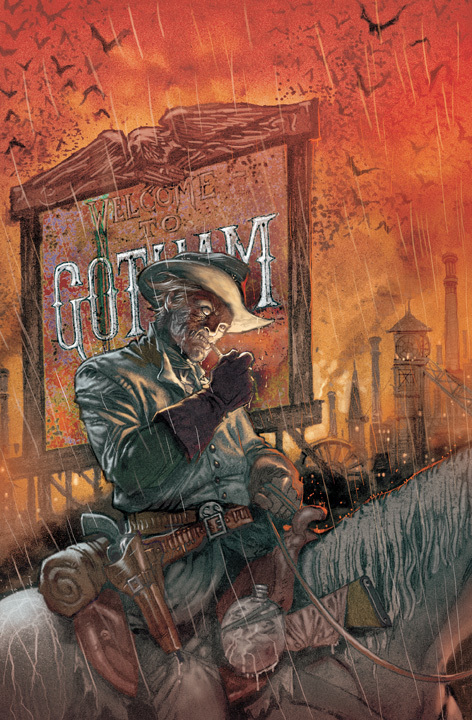 Someone above mentioned the absence of The Phantom Stranger. Did he say in the recent Superboy that he was about to reach the goal of his entire existence? It sounded to me like they were about to remove him from continuity…. Yes, the goal of his entire existence is to be placed in Limbo while “Shade, The Changing Man” joins the JLD. I still don’t get it. So no Zatanna and no Power Girl. CURSE YOU DC!!! In that cover of JUSTICE LEAGUE DARK, there’s a brunette besides Deadman, with fishnet gloves. 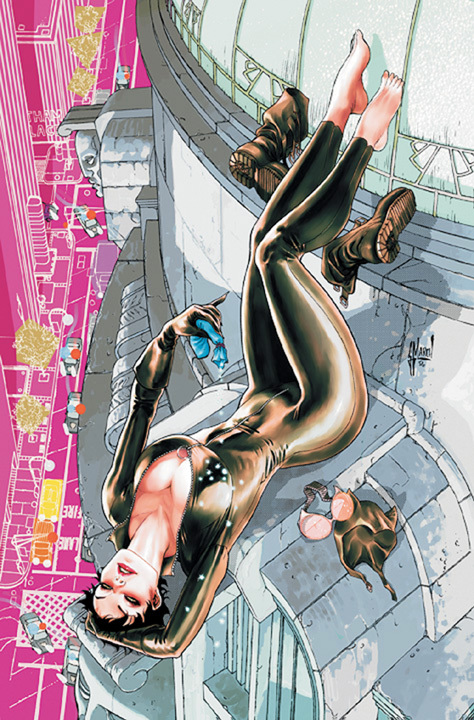 That’s probably Zatanna, with a different costume. 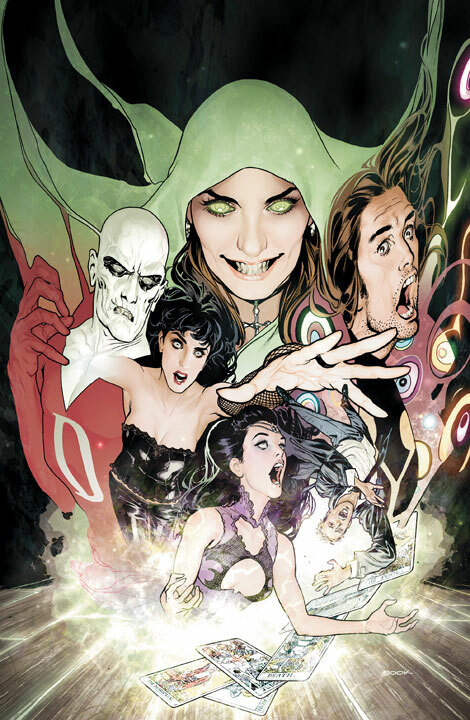 I did notice Zatanna there, it’s just that I waited decades for a Zatanna solo ongoing and now that I finally have it DC is taking it away from me, again! 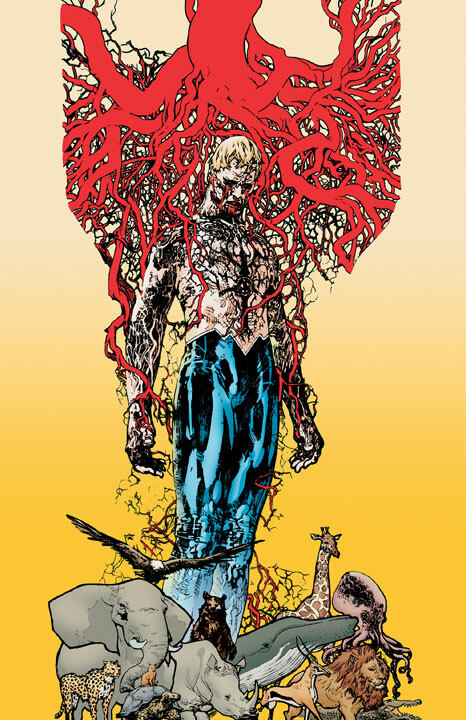 DC always do this to me, come to think, the last ongoing that I really liked that didn’t get cancelled was Starman and that ended ten or eleven years ago. Why, in the name of all that is holy, would they give LEIFELD pencil duties on ANYTHING!? Seriously. 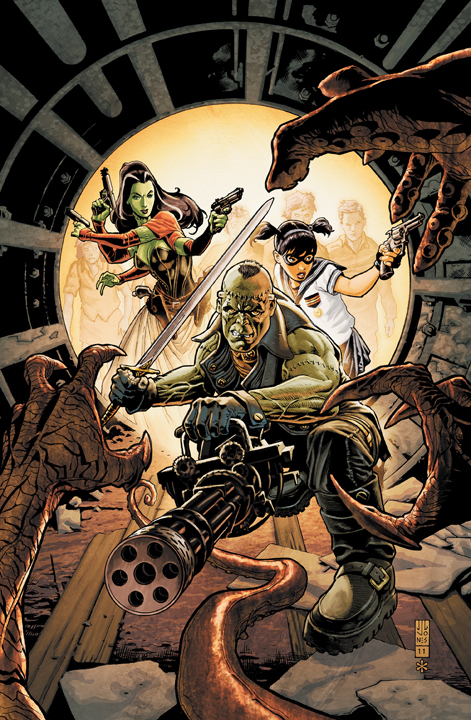 Dustin Nguyen? Not on the list anywhere. Leifeld? Oh, let’s give the guy who can’t draw hands, feet, guns or, honestly, anything a job. Yeah… THAT’S a good idea. Also, why does (who I assume to be) Red Robin now look like Black Condor? I’ve always found people who generally lack talent make up for it with superior networking skills. He’s probably a lovely chap whom others enjoy working with. Some of these look ok, some look horrible. Like all the new characters that are coming out of nowhere that no one cares about. Voodoo, Resurrection Man, Demon Knight and a few others will fail right out of the gate. And probably a few others. So hopefully they do have plans for PeeGee, Steph, Donna, hell even the whole of the JSA. One of the best things about DC is the legacy. Didn’t they just have a book last year about all the legacy of the DCU? I’m not thrilled about Supes being the first superhero? What’s with Supergirl’s knee holes in her boots? Superboy…he’s my favorite but….I don’t know. He’s new costume is outright horrible, and I hope his human DNA is Lex, cause I thought it was a good dichotomy to his character. Over all….I’m still not sold. I’m still overly worried about the whole thing. Well that is it for me with single issues. 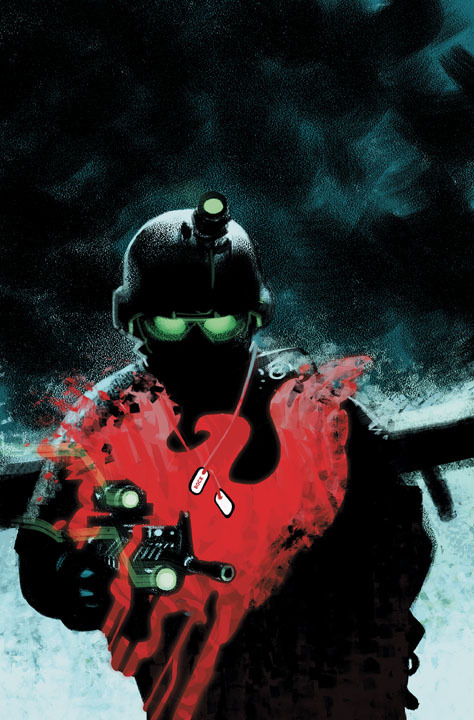 My pull list will just be trade paperbacks now. No more single issues. Not enough enjoyment out of that. I admire DC for trying something so radical. 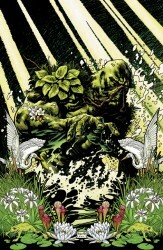 It will be interesting to see how much of it survives 20 issues at that. 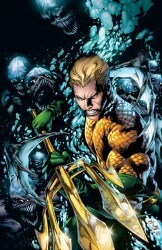 We all know Aquaman is not going to last. 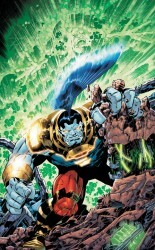 And I Vampire, Resurection Man, OmAc, what the hell. Nice tries but really. Aquaman will last until Geoff Johns leaves. Then it will be ran into the ground by the next writer and cancelled just like nearly every other title he has written (except Booster Gold, it was only cancelled). Okay out of these ‘all new all different, but still the same’ titles twelve are Batman. And I won’t be going anywhere near them. 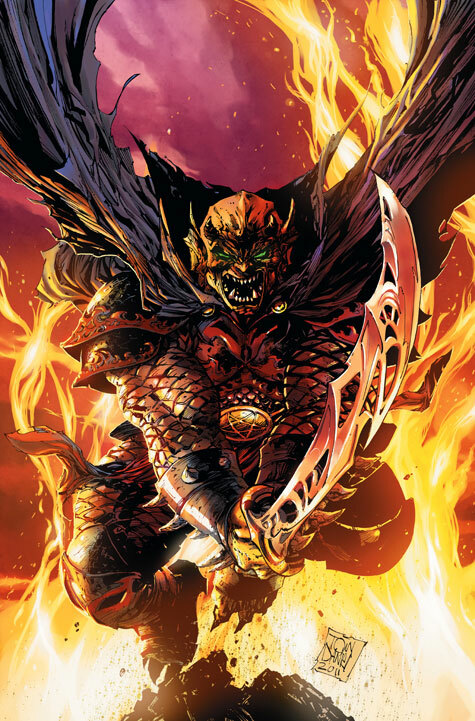 I’m always up for more GL, looking forward to Aquaman again, excited for Babs as Batgirl again, Flash has my interest, and I actually like the update to WW… Also love Blue Beetle and am glad to see him getting a second shot… Fury of Firestorm is also one I’d love to read!! 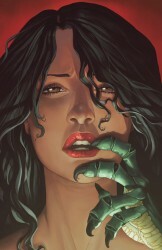 I am afraid of the new Supergirl comic the most. I’ve been reading on the webs that the new Kara is a combination of Powergirl and Supergirl, and I don’t care for Powergirl that much. She’s alright, but she will always be a sore spot for me. 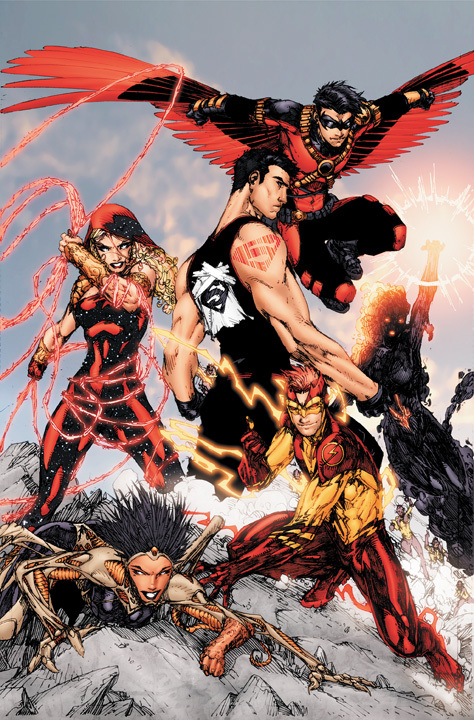 I will read Legion Lost, Legion of Superheroes, Supergirl, Superboy, Action, Hawk and Dove (just because of Gates) and Static. 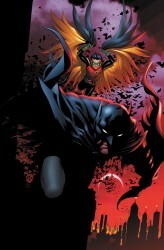 I might read Teen Titans if Raven is in it. But where is Beast Boy and Raven? Where did they go? 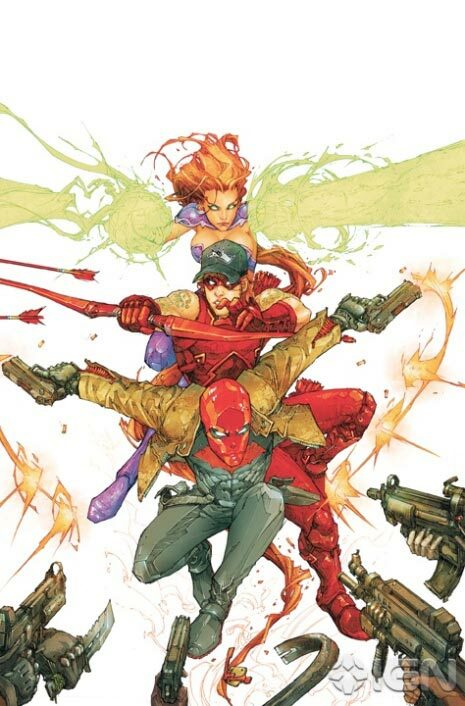 I saw Starfire and Nightwing, but what about those two? Where did they go? Did they get killed in the reboot? Oh, and I’ll pick up Resurrection Man. It might be fun. I just don’t how to feel about all this… I’ll give it a chance but I don’t know. I might just leave DC if nothing turns out right and write my Year One Legion until everything gets back to normal. I’m thinkin this is kinda like a lauch for Ultimate DC that DC will keep going for a year to gather new readers which Ultimate Marvel had a hard time with. 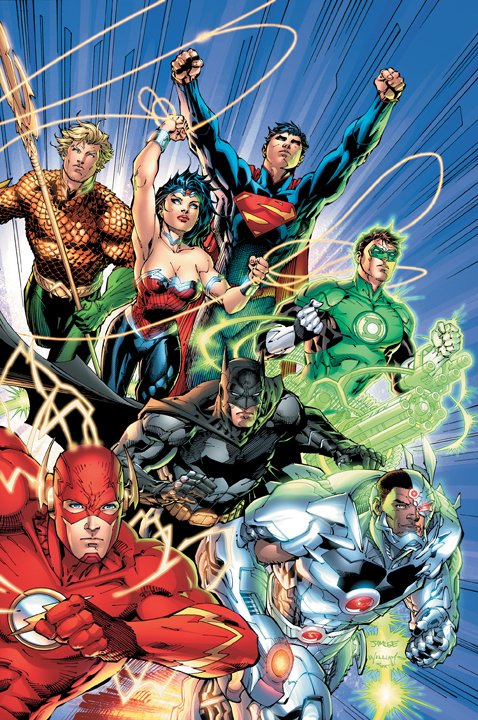 Then in another year the classic DCU will reappear. I hope anyway. There are a lot of peaks and troughs as far as my interest levels go. Action Comics, Animal Man, Batgirl, Blue Beetle, DC Universe Presents, Deathstroke, Detective Comics, Grifter, Justice League Dark, Justice League International, Nightwing, OMAC, Red Hood & the Outlaws, Sgt. 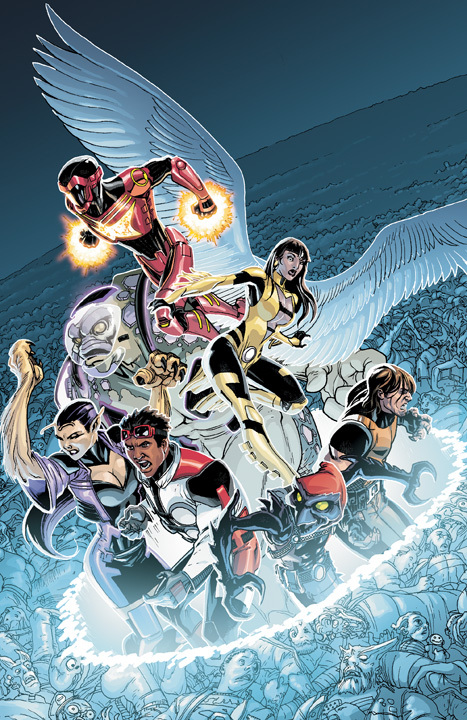 Rock, Stormwatch, Suicide Squad, Swamp Thing and Firestorm. 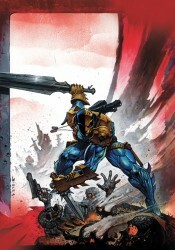 I’ll be buying them digitally; but if any titles fail to grab me from the first issue, I’ll drop them like a bad habit. 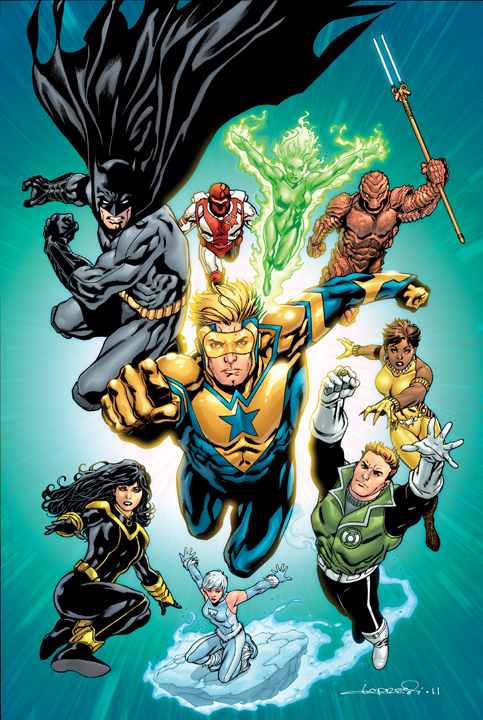 Now, is Booster Gold Cancelled? 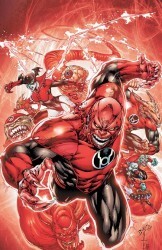 OR, considering how he is unaffected by Flashpoint, is he going to be the only one to keep his numbers and avoid the relaunch? Cause that would be awesome. If not, I’ll just have to settle for JLI. I’m so itching to try everything: some of these I can see being great run-away hits. So here are the ones I’m buying at the store. 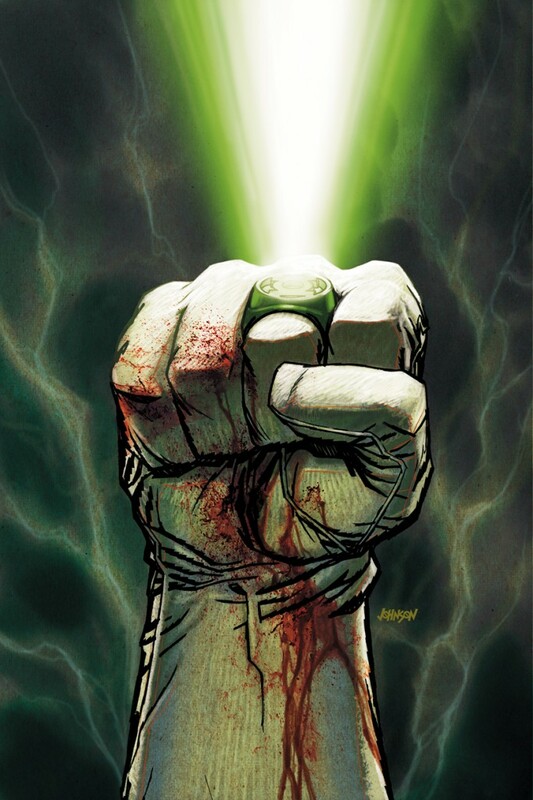 These last three GL books are on a 1-issue probation, and even that depends on how much Green Lantern I still want after the movie. Here are the ones I’ll buy digitally, once they go down in price. If they’re good, I’ll bump them to my actual pull list. Right. 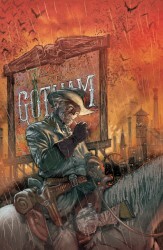 So i’ve gone from buying, wihout fail for two years, THREE DC comics, to maybe thinking aout getting All Star Western. And that’s it. The rest looks ghastly. So heartening to read all these non-comic people on a videogames board I frequent now picking up books in September. Most state that they feel it’s a perfect time to start reading as we’ll all be on the same playing field. That is part of the reason DC is doing it. …but it seems everywhere I go, there’s a Tweet or a comment from her…and I have not seen many from others…could it be of the love people have for her and as such, she gets “re-tweeted” and quoted all the time?? I will be buying Flash and Maybe GL and GL Corps. 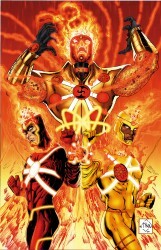 The Jury is still out on Firestorm. I have followed the character since the 80s and am mildly curious about what Ms. Simone can do. I have collected Batman and Detective for over 20 years. This relaunch puts an end to that. I agree with Eric that what DC is doing is admirable. They are getting out of the rut that they have been in for the last 20+ years. I really hope that a lot of their titles succeed, but I can’t see the War and Western genre lasting too long. If they had a $0.99 price point on their digital comics after a month, I would be tempted to try a lot more titles. Heck, I might be tempted to get an iPad. On a related note, I spoke to my LCS owner in Atlanta, a lot of their subscribers are cancelling their subscriptions for DC ‘in droves’. I’ll adjust accordingly after September. BATWOMAN #1 finally. 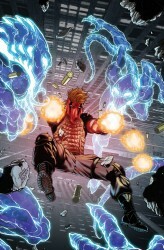 Grifter, Voodoo and Stormwatch look interesting. As a huge Wildstorn fan, I hope the characters are done justice. 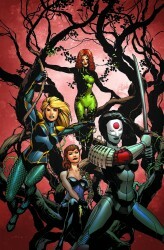 No Secret Six or Power Girl? Those were two of the few DC titles I actually read. Are the Wildstorm characters now officially part of the DCU with the reboot, similar to when the Crisis hit years ago and several properties they had bought got “merged” into DCU? Or are they still a seperate part of the multiverse like when Mr. 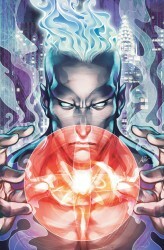 Majestic showed up in Action Comics and Captain Atom was in the Wildstorm universe a few years back? I just wanna say What in the hell is that new Teen Titans!?! The title that caught my eye out of all of these is the one that most people don’t remember. It was one of my favorite series that I hated to see cancelled (We won’t mention Xero. It’s still a sore spot for me and my wife). Mitch Shelley was a man with amnesia that was injected with nanobytes that, everytime he died, would give him a power to combat the cause of his previous death. Might sound a bit cheesy, but Abnett & Lanning made it work! I’m glad to see it’s back! Give it a chance. Going off about Liefeld is like making fun of George W. Bush: after a while, it just gets too easy, so why bother? Will there be a cameo by some Wolverine-wannabe character with badly drawn feet in a classic pose as if they’re jumping into a battle? Oh. I feel so dirty. No Booster Gold?! I hope the current series continues. Green Lantern, Justice League International, Resurrection Man, The Flash, and Blue Beetle, and Justice League Dark. I wish I could be more “positive”… But, I’m POSITIVE over half of these titles will last less than a year. It looks like a very diverse “menu” and I guess it’s a very bold move. My constant complaint is the damn BASEBALL cap infection! Baseball caps belong on baseball PLAYERS (and fans. )… no superhero would choose it as proper headgear for crime-fighting just to be “cool”. While running fast, flying, or getting hit in the head… picking up your cap and putting it back on during battle would be senseless. And, let’s be sure to cover up our female heroes… or dress them like psycho-strippers… or smother them with outrageous cyber-gear. I feel like I’ve gone back in time and all those Image, Darkhorse, and “other” companies made DC give in. Just can’t wait to see the “relaunched” classic villians. Drag out the whips and chains boys and girls!!! Here is my question….which one will be cancelled first? My money is on Hawk and Dove, Grifter, or Mister Terrific. 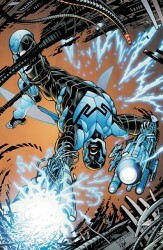 Does ANYONE like Rob Liefeld ? I would guess Stormwatch, OMAC, Suicide Squad and Flash will maybe last a year. 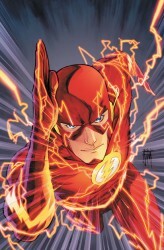 Hey, I love Flash, but how many #1s has that comic had in the last decade ? I’m most excited about JLI. I have been a fan of that since day # 1, way back in 1987. 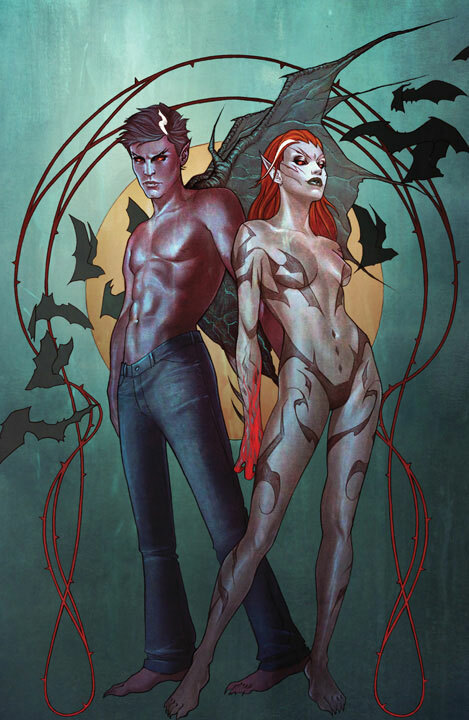 I am curious how the Justice League Dark will be. I will be getting it for sure. I’m just upset that we don’t have a new JSA. 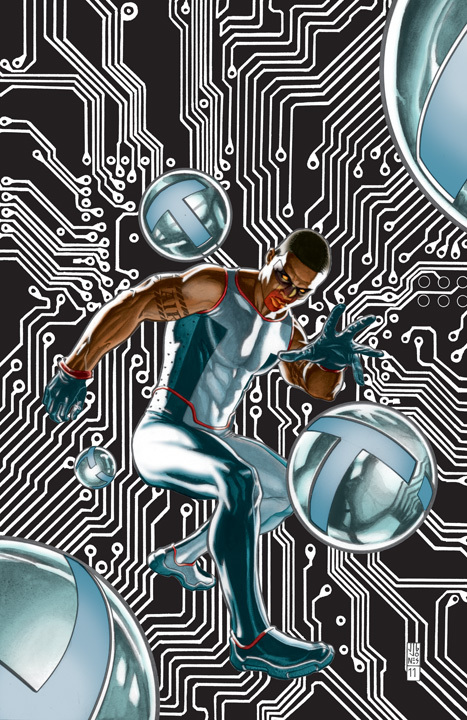 I like Mr Terrific, but I could care less about his solo series. 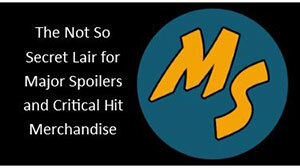 My prediction: 52 new series – half of them will be gone in 12 issues. 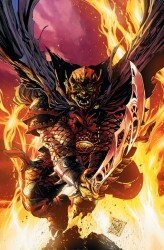 Bat-Wing, Frankenstein, Demon Knights, Voodoo… come on. One look at the *new* *new* *new* all-new Teen Titans – bound to fail. 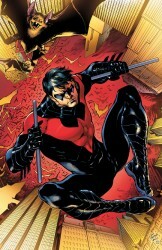 Red Robin’s costume looks great though. 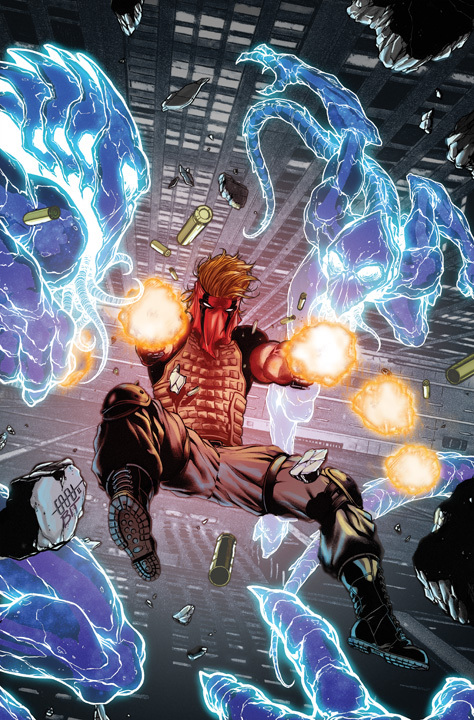 Nightwing, Grifter, Stromwatch? Ok, cool. If done right. One good thing: I’ll have to buy much less comics than before. I just checked the list myself and all i can say is whaaaaaaaaaattttttt? You’re doing titles like Stormwatch(????????) but not even a single JSA title?So the original Dc super team doesn’t even exist in the new DC universe? Way to go Mr.Geoff Johns,kepp succeeding where even the Anti-Monitor has failed! In utterly and completely destroying the DC universe in it’s core! 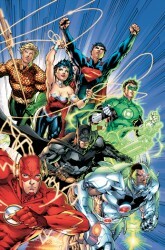 Jim Lee doing Justice League. That means issue #1 in September, #2 in November, #3 March of 2012, #4 announced for October 2012, then pushed out to January 2013, then to July 2013, then the cancellation. Except he’s been penciling it for half a year already. His delays are the least of the problems. 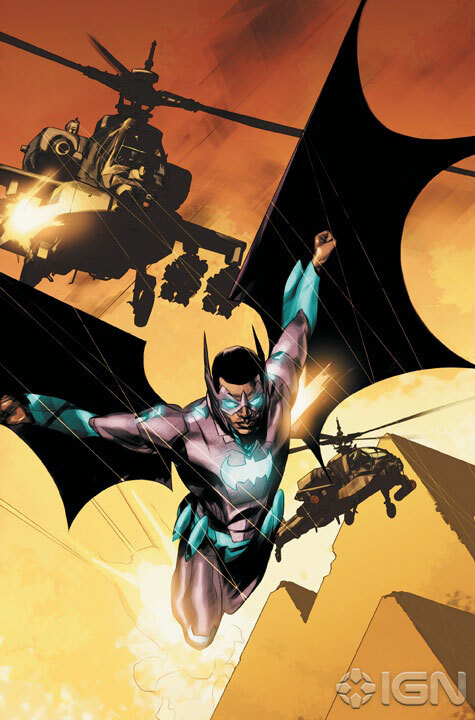 i really don’t get the need for a relaunch, i was startin to get into the new batman incorporated, is this now cancelled? Nope. 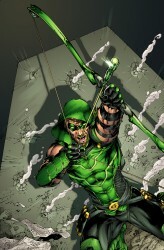 The book was planned to go on hiatus, so it will return in early 2012, I b’lieve. that’s too long! 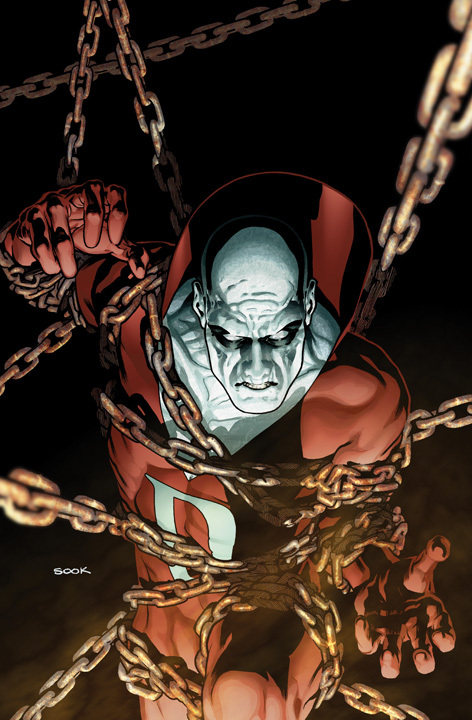 is this hiatus for all of DC’s comic line? Wow! As a member of the Old School Comic Book Collectors(to be a member you had to have bought a new comic 20 cents or less)and from what I’ve seen here…I not really impressed! 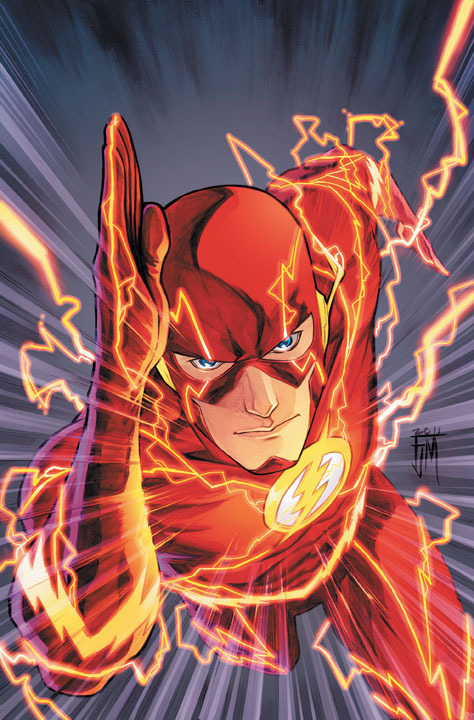 DC is taking a big…no, HUGE gamble on this Flash-Point story line and 52 dreams of major dollar signs, which could be a horrific NIGHTMARE for the comic book industry as a whole! Are the only titles that look somewhat interesting and out of 52 titles…hum…not sure if this a stepping on mark or this is where I get off the DC bus for good!